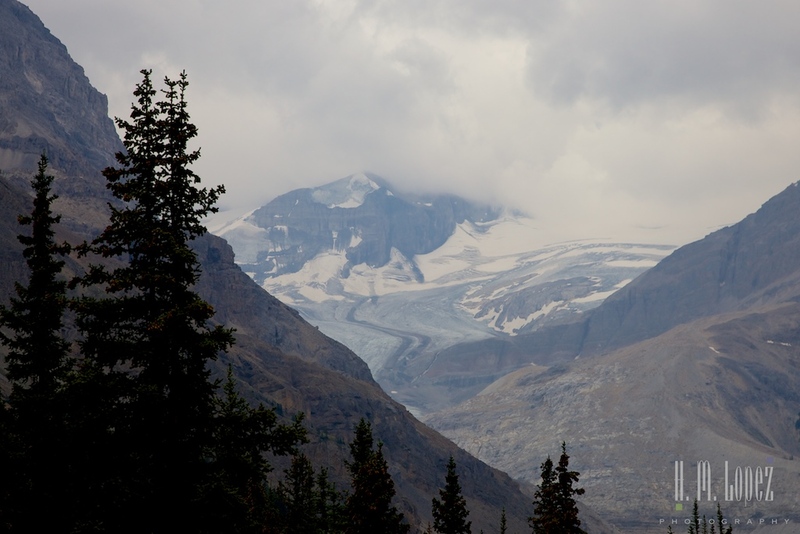 We looked forward to a spectacular drive on the Icefields Parkway from Jasper to Banff, Canada’s first National Park. 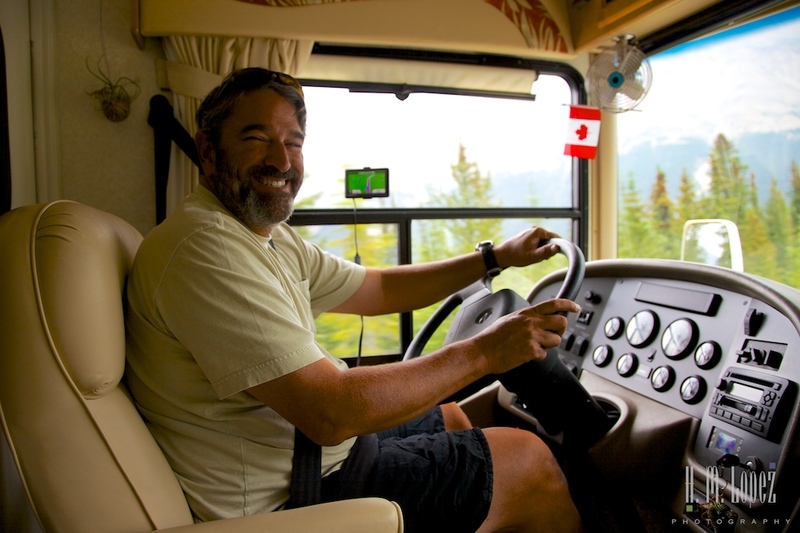 But, because of our recent experience driving from Vancouver to Jasper, we were a bit apprehensive as well. Especially about a couple of really steep climbs. 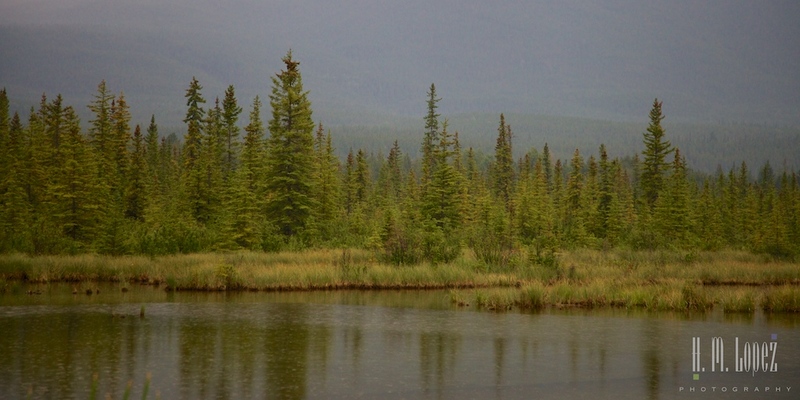 So we set out really early, and the weather was on our side – cloudy and in the 50’s. 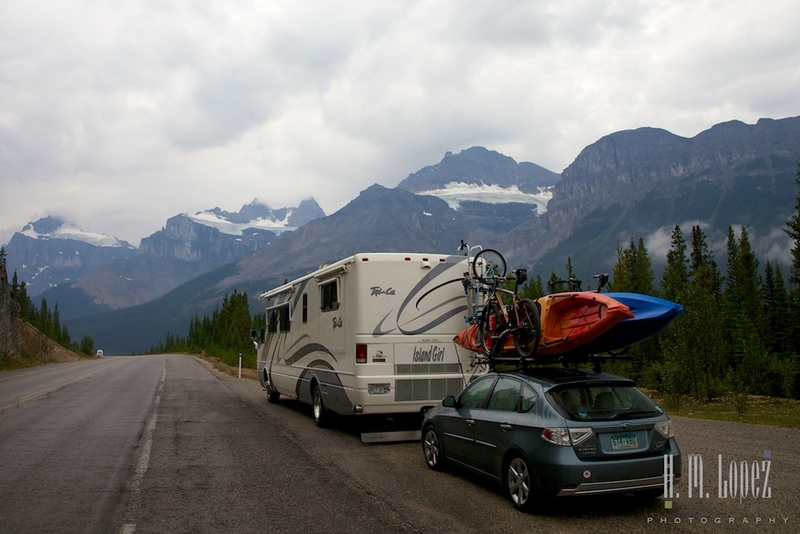 The Icefields Parkway is truly one of the most stunning roads we’ve ever been on. Surrounded by massive mountains with huge glaciers, and dotted with brilliant rivers and lakes and verdant meadows full of wildflowers. And Island Girl did great on the climbs so unhooking the car was not necessary. Some sections were first gear and 15 mph though. Along the way, we took a few short walks to overlooks of impossibly colored rivers and lakes. 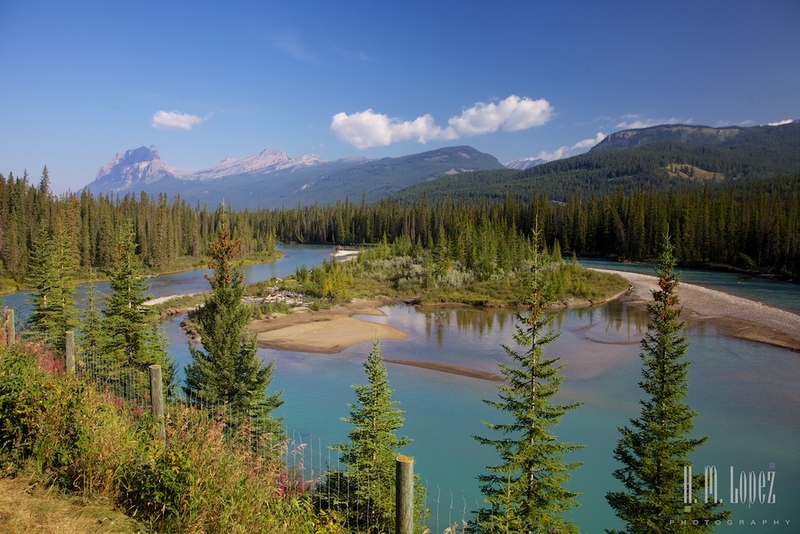 And crossed the border from Jasper to Banff National Park, Canada’s first national park. 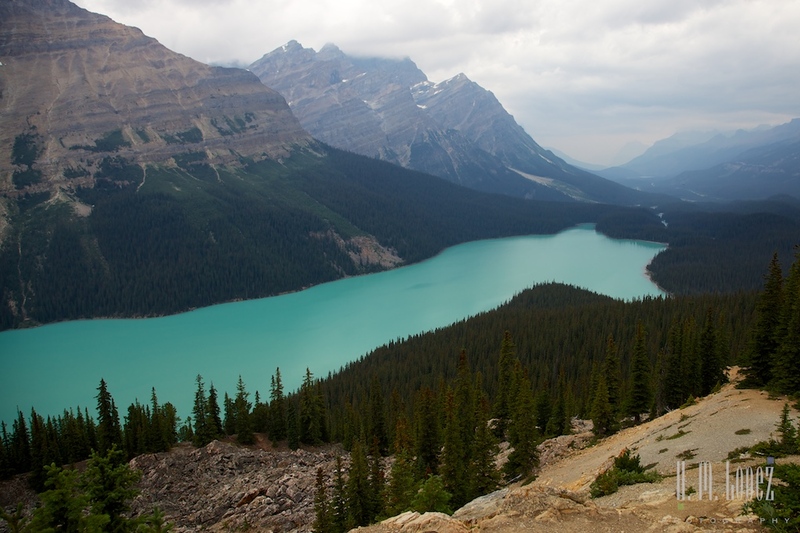 One memorable stop was Peyto Lake, one of the bluest lakes we’d seen so far. What a shame that the weather was so cloudy, I imagine the view of the lake must be really astounding on a sunny day. 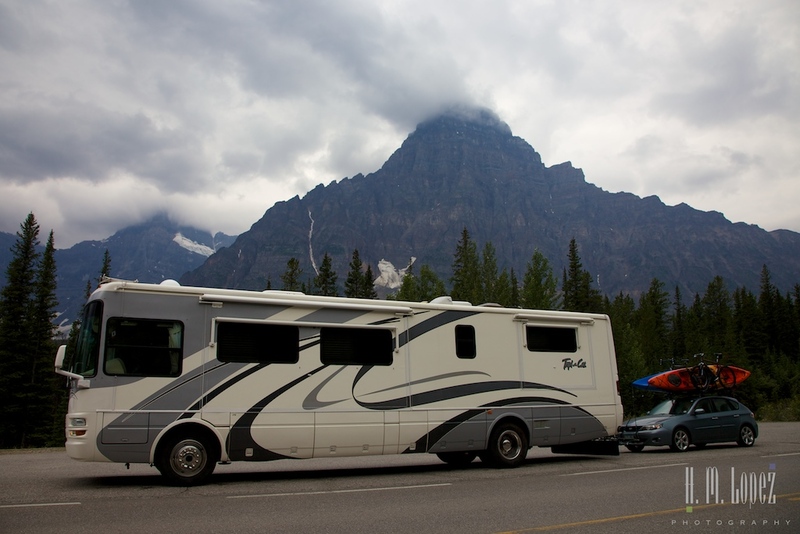 We arrived at another huge national park campground, very conveniently located by the beautiful but very crowded town of Banff. The only inconvenience was that since the campground is located in the midst of bear habitat, we had to put away our grill every time we used it. Other than that it was a very pleasant place with lots of trees around and hiking trails on the property. The weather forecast projected rain every day but one. 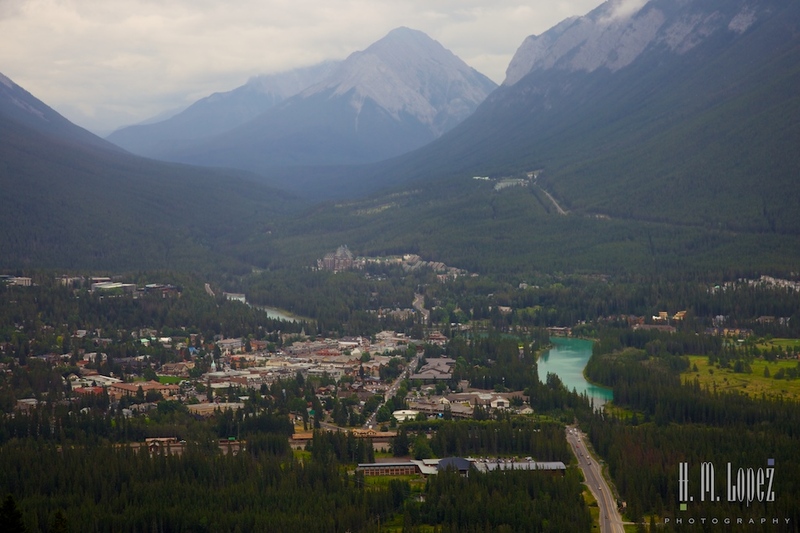 But the common saying around Banff is “don’t pay attention to the weather forecast, it’s the mountains”. Meaning that weather can change at any time. On our first day we opted to go into town and to the local farmers market. A small market that is about half arts and crafts fair, so there wasn’t a lot of food. Probably directly related to the amount of tourists in town. But we still found some great empanadas and pulled pork sandwiches. 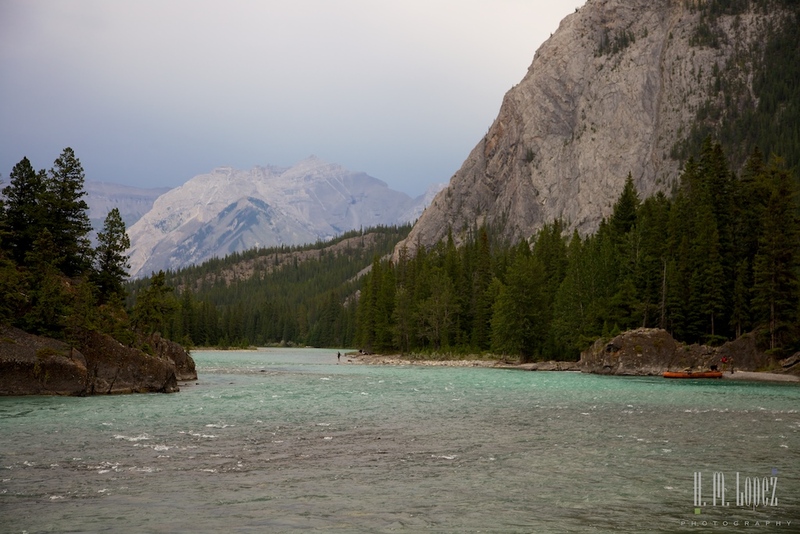 Just behind the farmers market was the Bow River, another glacial river. It seems as if everywhere you turn around these parts, there’s a beautiful river or lake. 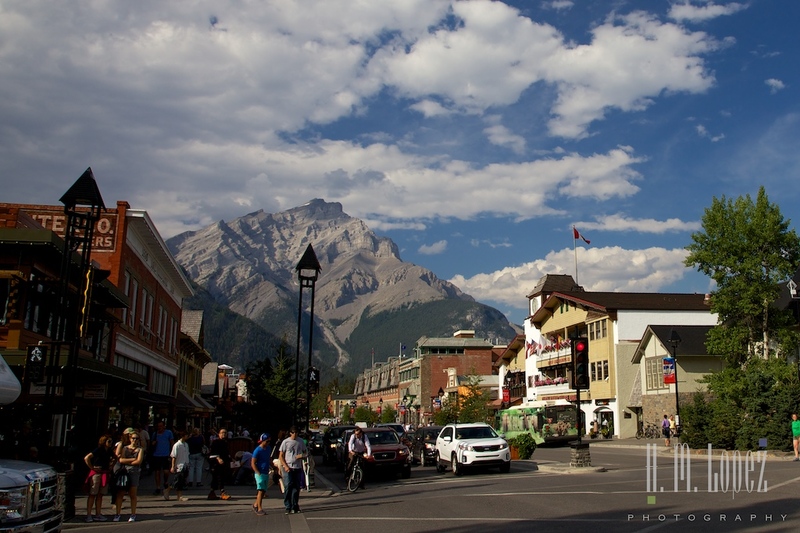 The town of Banff has lots of restaurants and shops including the Hudson’s Bay Company department store. 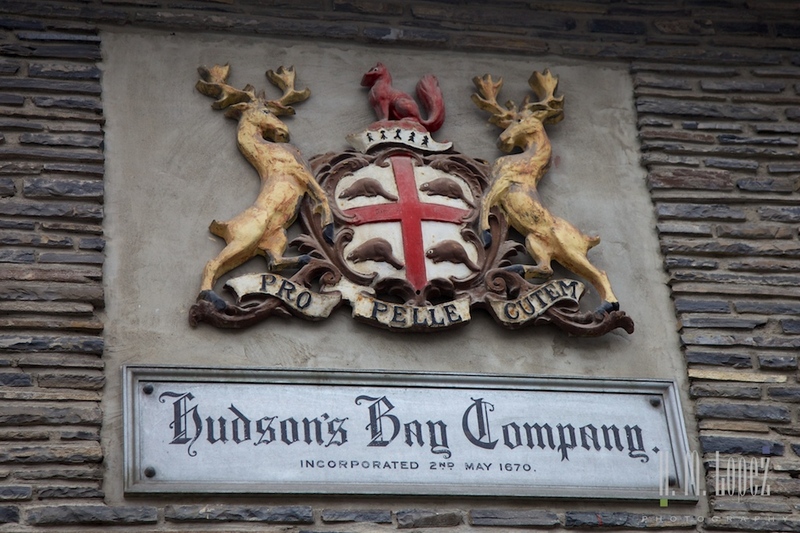 Founded in 1670 (!) 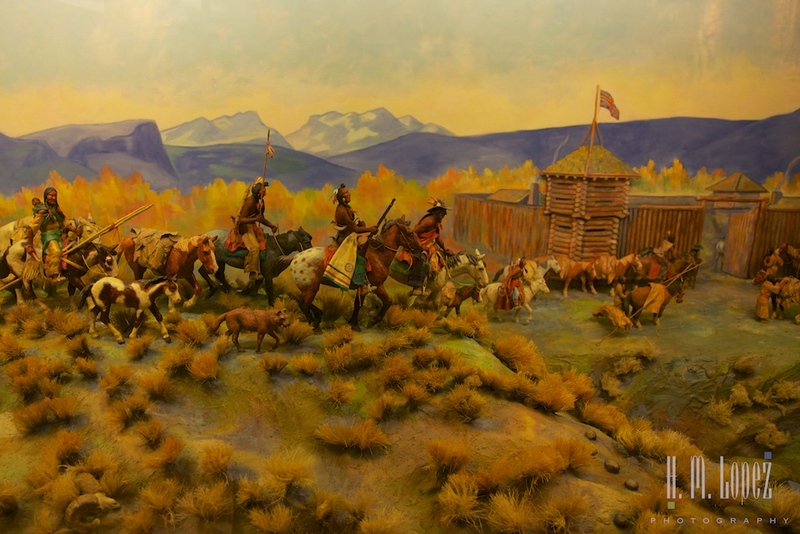 as a fur trading business, it is North America’s longest continually operated company. 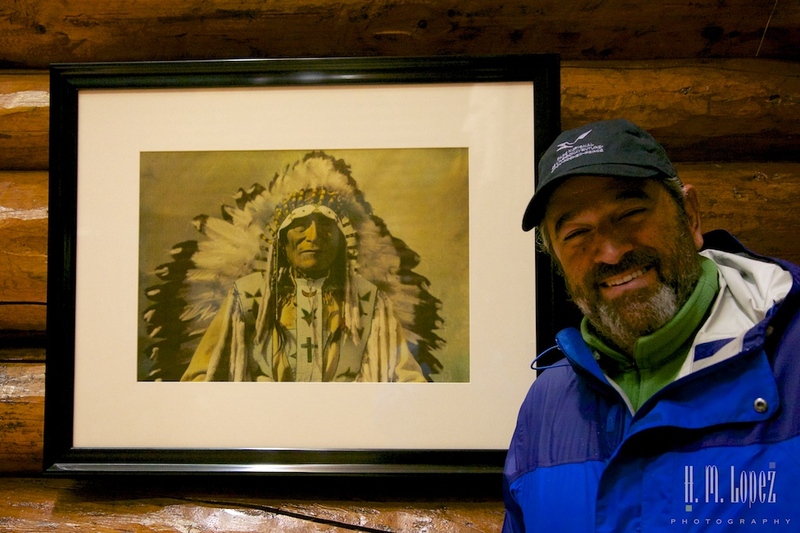 Hector and I had just been reading about Hudson’s Bay Company in a book about the Lewis and Clark expedition, so it was cool to see the store. Although these days it is a pretty normal department store (they own Lord and Taylor). But they did have beautiful canoes for sale in addition to the normal stuff. 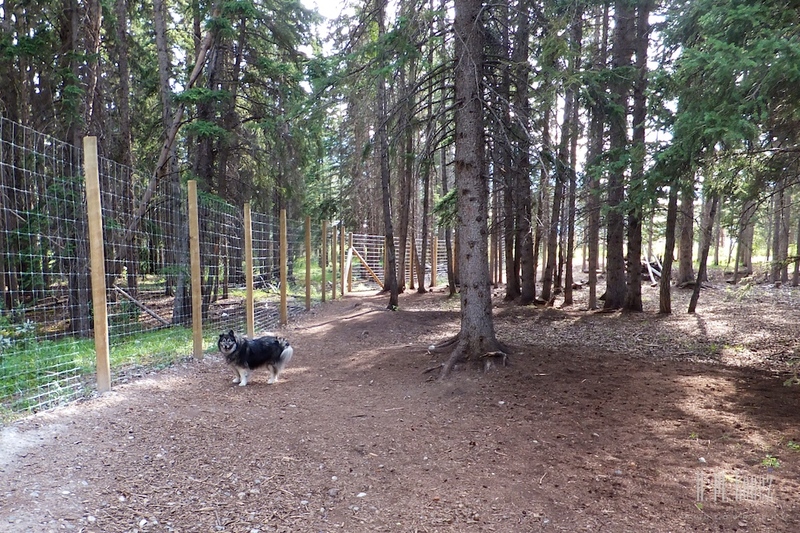 Banff townsite also has a very nice off leash dog park. 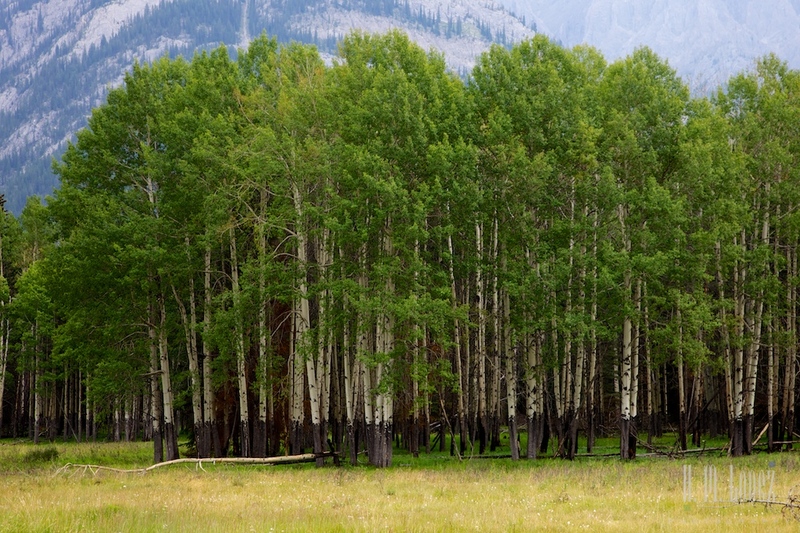 It is a large natural wooded area with a fence around it. What a great idea! Angel enjoyed exploring all the trees and holes in the “forest”. 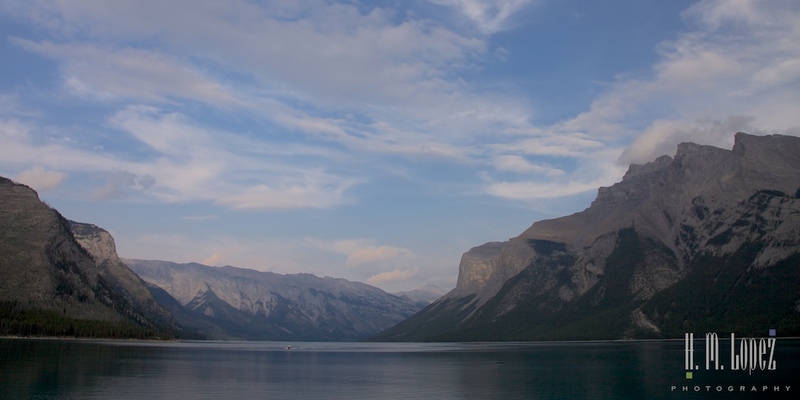 Near town is Lake Minnewanka, yet another scenic little spot. 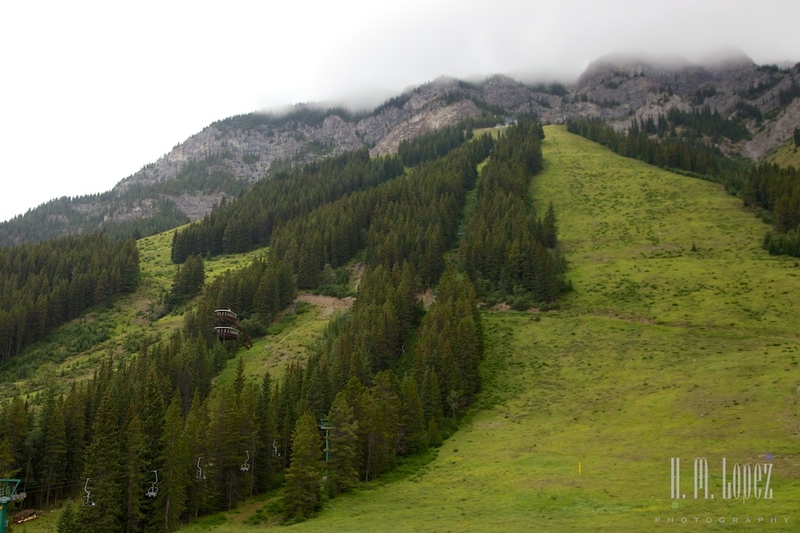 And Banff is a winter ski resort and offers chair lift rides and biking in the summer. We just drove to the ski area briefly for a quick peek. 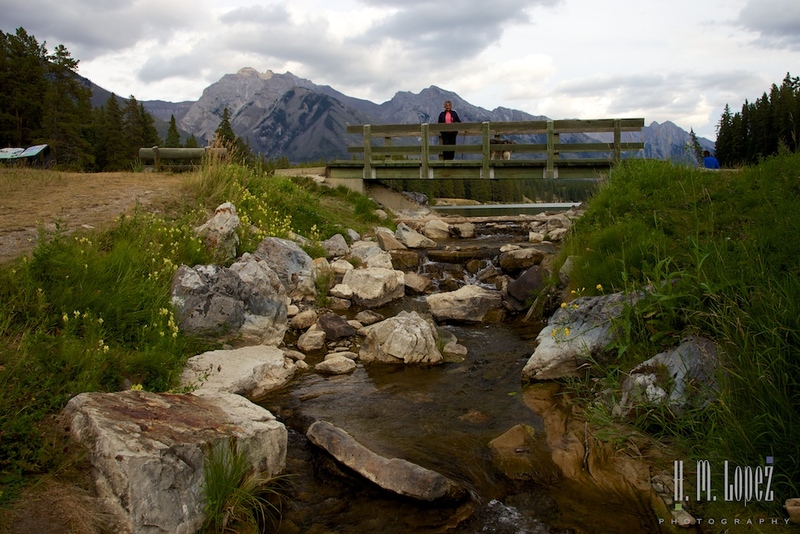 One of the less traveled roads near Banff is the Bow Valley Parkway. 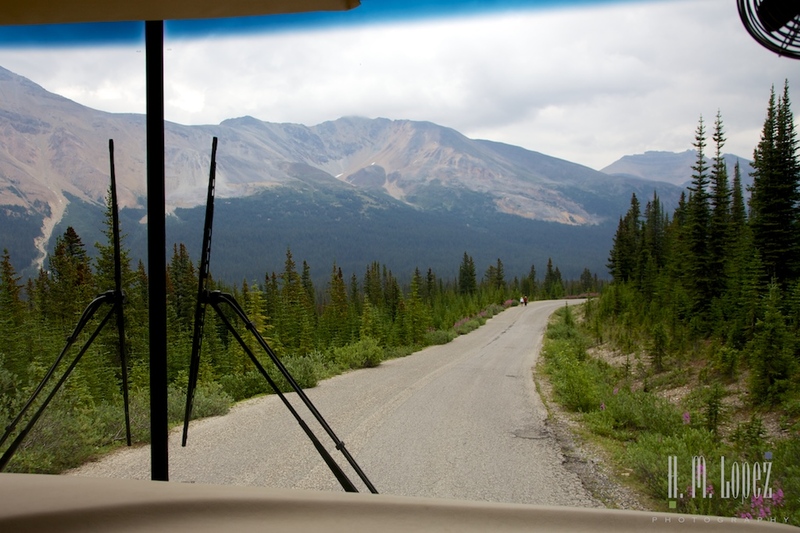 This used to be the only road to Lake Louise, but the Trans Canada Highway is now the faster route. 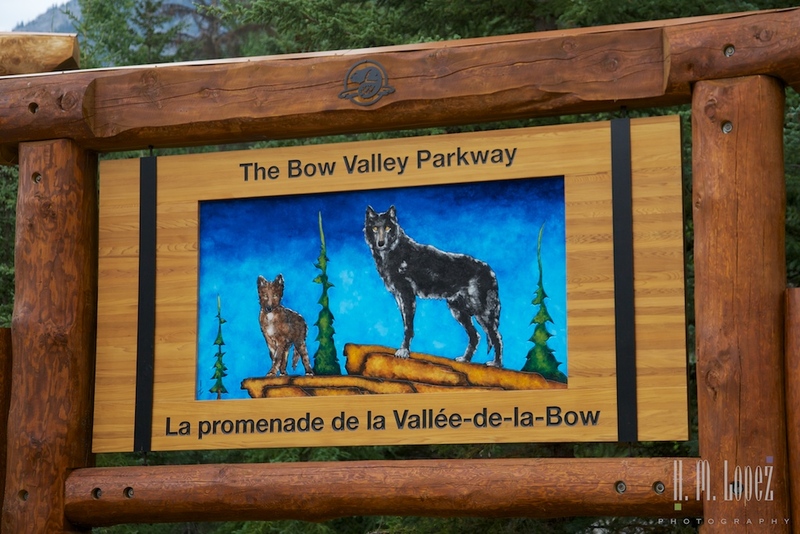 We found Bow Valley Parkway much more pleasant. 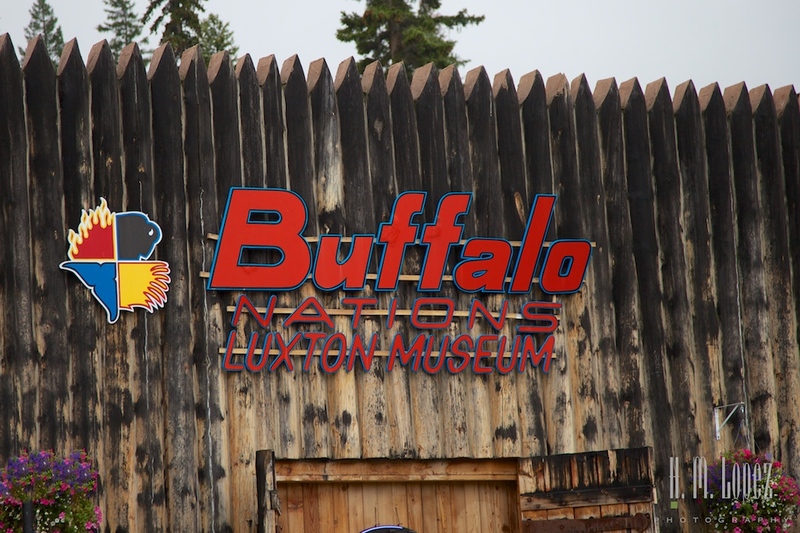 It also has some cool interpretive displays and is known for wildlife sightings. 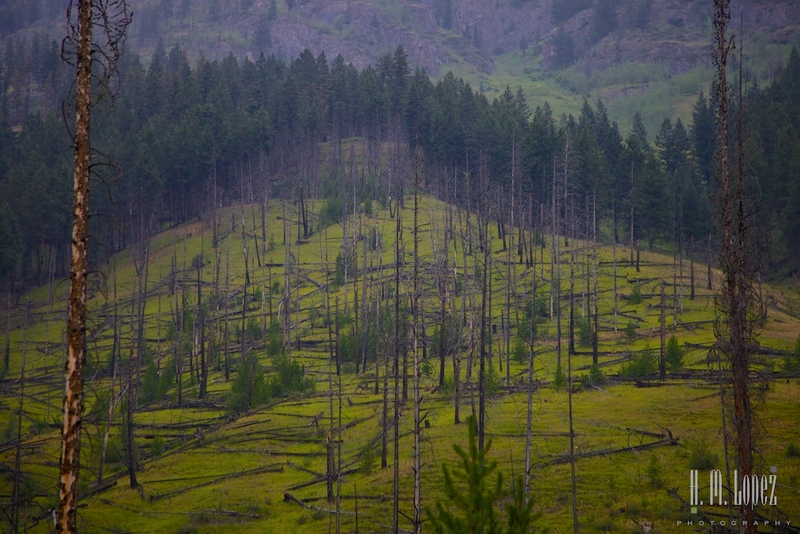 And there is where we spotted the largest elk yet, one with an eight-point antler. 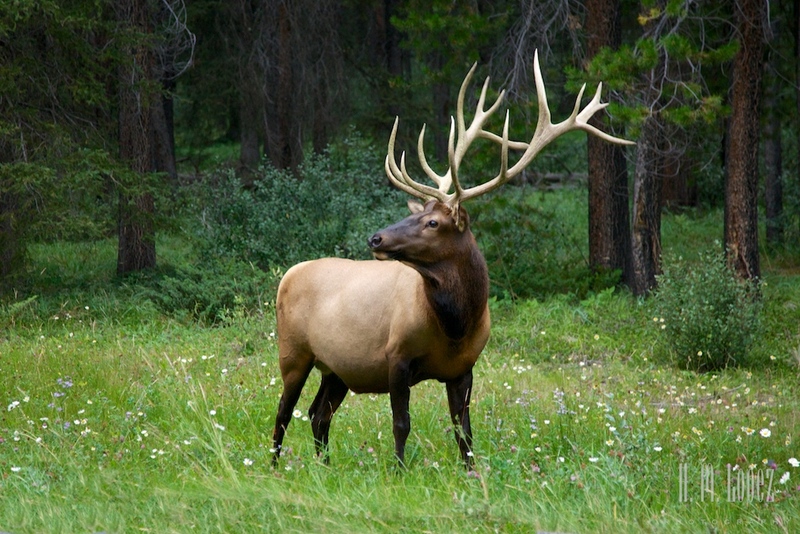 Elk bulls shed and grow new antlers every year (the difference between antlers and horns), and the more mature elk have more points. Those with eight points or more (rare) on their antlers are called Monarch Bulls. 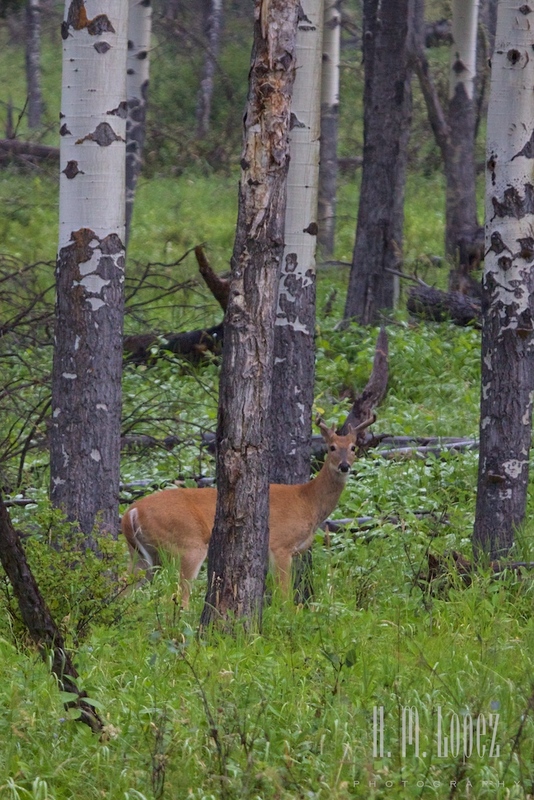 This bull’s antlers no longer had the soft velvet membrane that covers them when they start to grow, instead they were smooth and had sharp points. 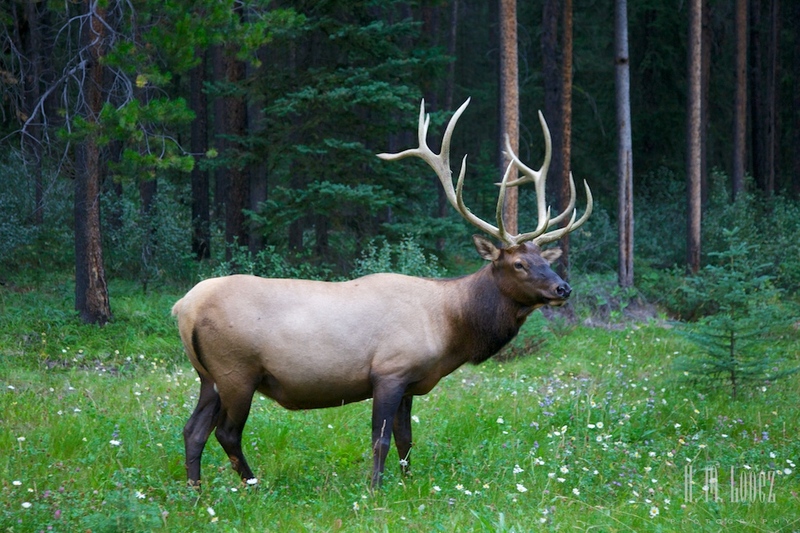 The velvet membrane dies when an increase in testosterone cuts off blood flow to the antlers. The bulls then rub the antlers against trees to rub off the velvet, in preparation for fighting other bulls during mating season. This bull was a majestic animal. 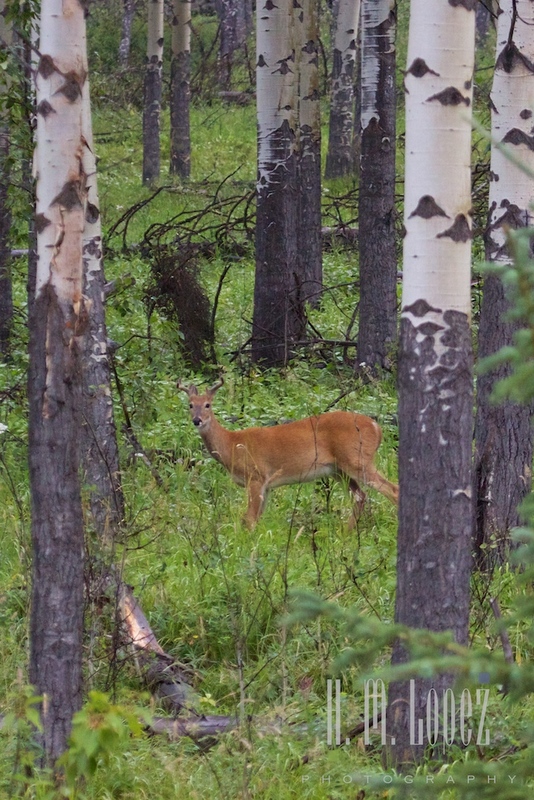 We also spotted some deer, but no luck finding bears. 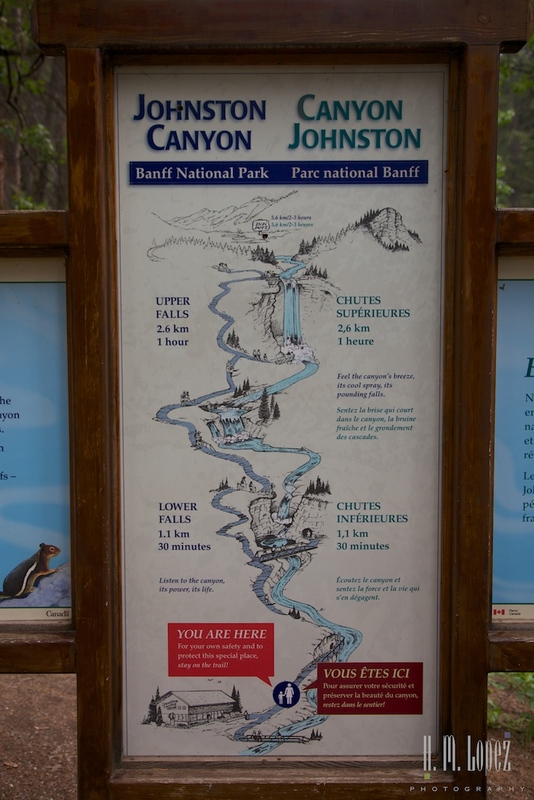 One of the more popular trails along the Bow Valley Parkway is Johnston Canyon, which was our first hike. We chose the longer of two trails but the bottom half was pretty crowded. Angel was doing her superstar stint again. She allowed photos but gave no autographs. 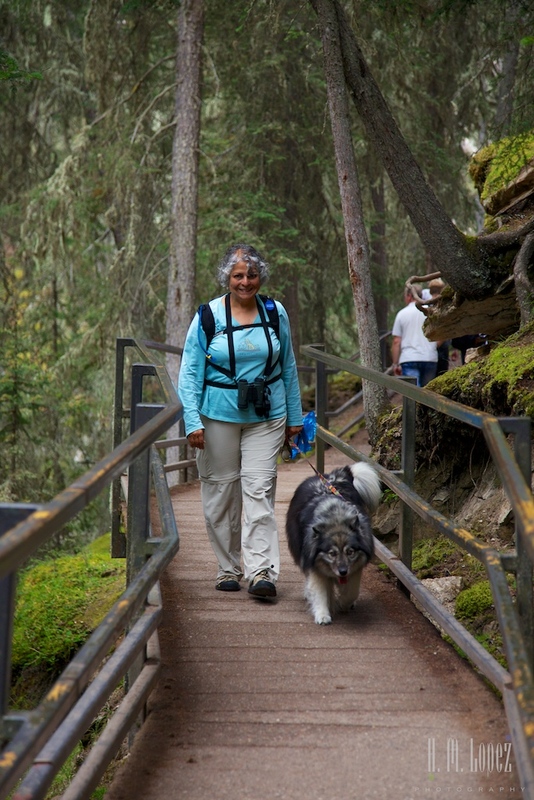 The trail goes to three waterfalls: lower, middle and upper. 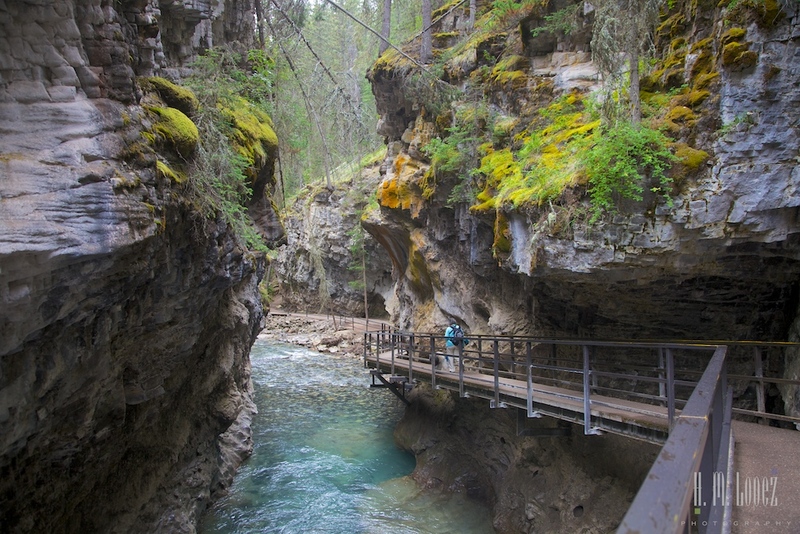 It’s a very steep sided canyon so the park has built elaborate walkways perched on the side of its walls. 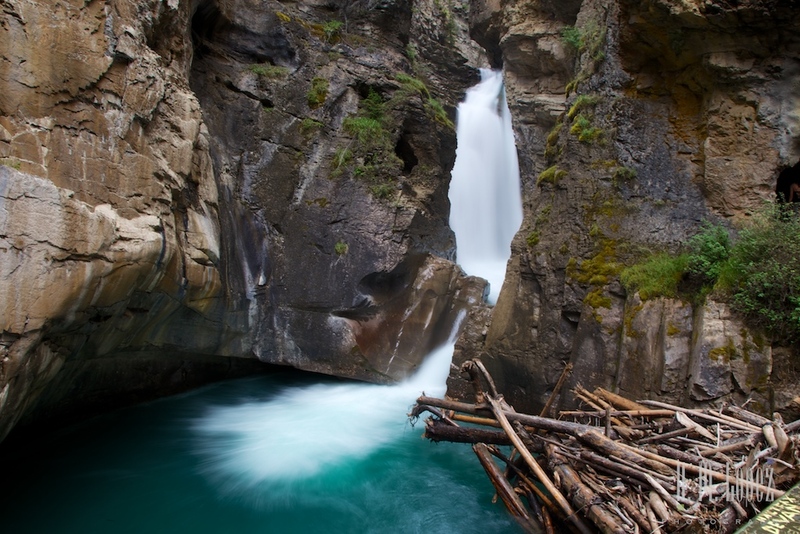 The water in the canyon has that brilliant glacial color. 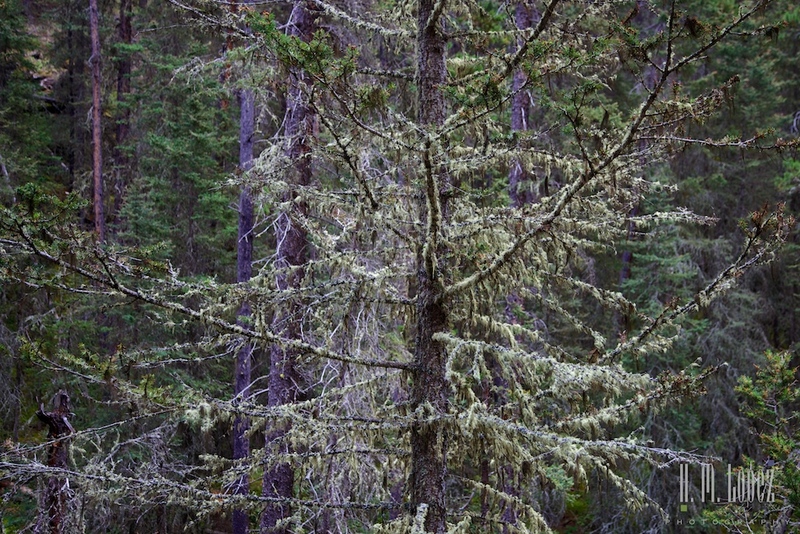 And its surrounded by lots of vegetation including many trees and different types of lichen and moss clinging to the canyon rocks. 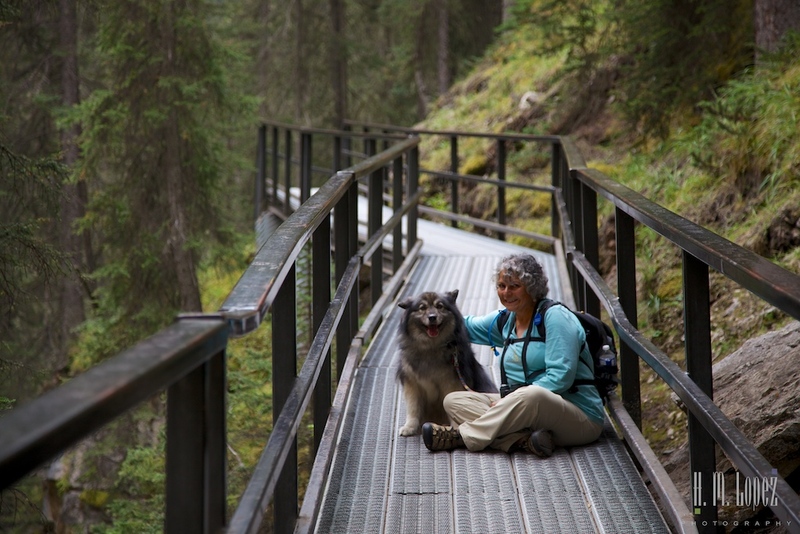 The day warmed up a bit and the combination of the length of the trail and warm temperature was a bit much for Angel, who was pretty exhausted on the way down. So we stopped plenty of times to rest and she had lots of time for admirers to fawn. Including one who walked up to her while she was pooping and said “she’s even beautiful when she poops!”. I am not kidding. 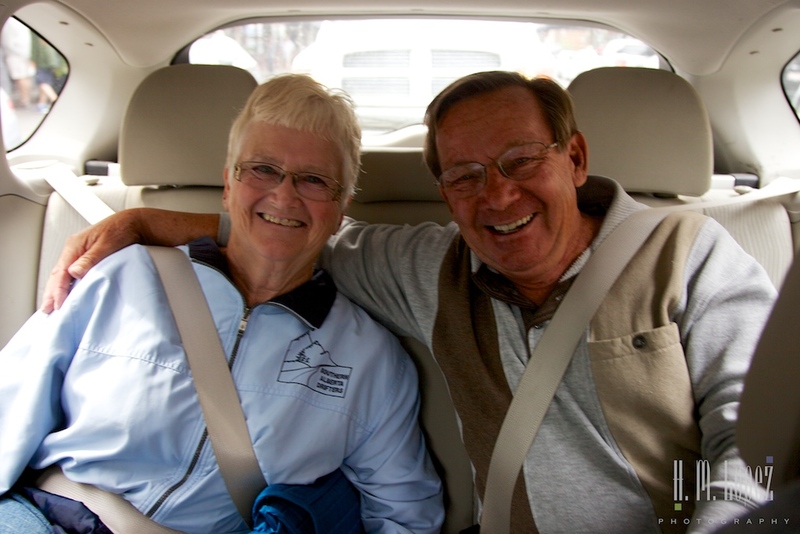 Doug and Tricia drove out to meet us at our campsite where we caught up on life since San Diego and then continued our visit over lunch in Banff. We hope to connect with them down south again this winter. The next day’s forecast called for rain and so we ran some errands. Including buying dog food. 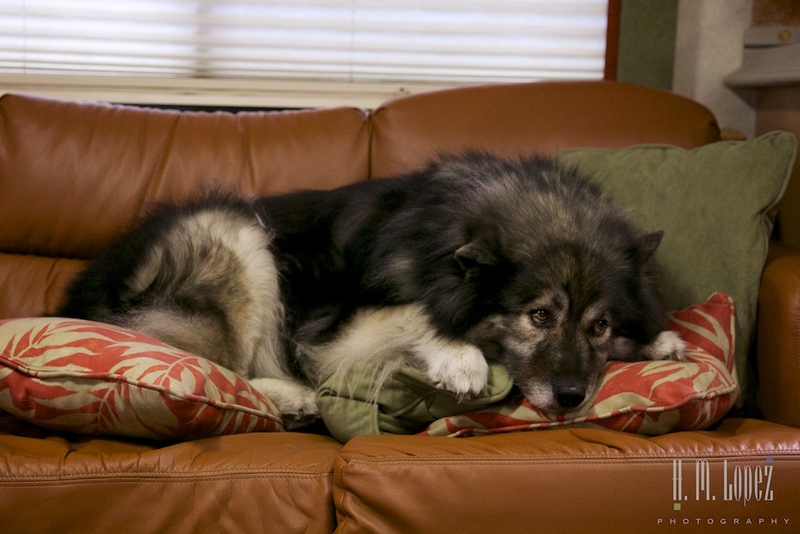 We give Angel a very specific type of food, and we figured we might have to drive to Calgary. Which was exactly what I discovered after calling twelve pet stores in some of the closer towns. So we went to Tail Blazers, a “health food store for pets”, in Calgary. John at the store was very helpful and nice, the only bad news was that the food cost twice as much as in the states (!). We won’t miscalculate again. 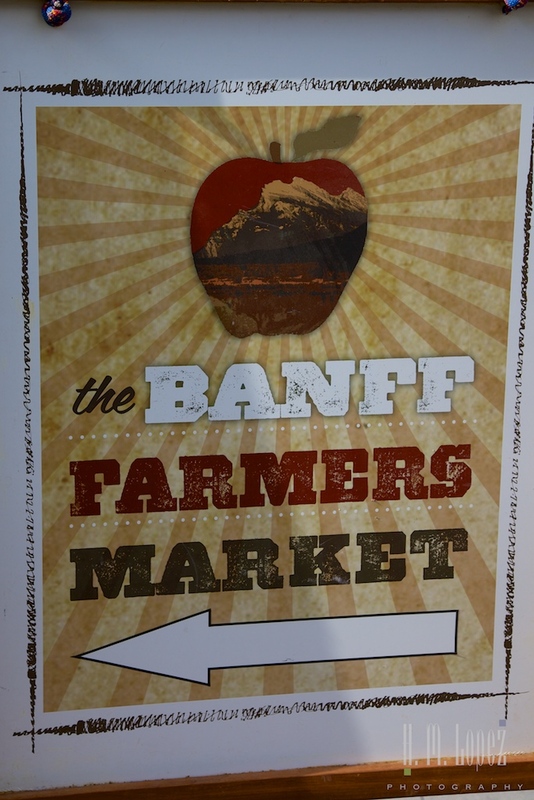 We also found a great grocery store – Calgary Co-op – with tons of great food and bought some of the famous AAA aged Alberta beef. Deservedly famous, the steaks were delicious. But no photos of Calgary. 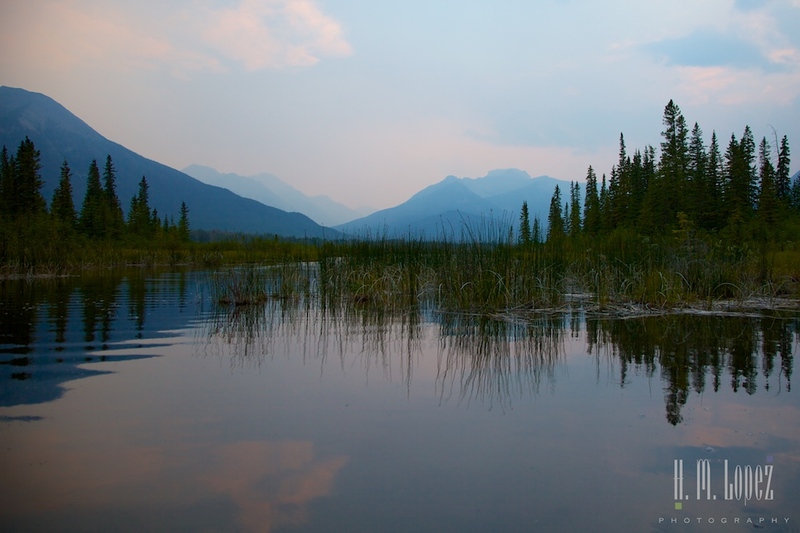 Seeing so many beautiful lakes had put us in a kayaking mood and a ranger at the visitor center had recommended the Vermillion Lakes for an afternoon/evening paddle. These are three lakes near town that are known for lots of birdlife. We started at the Third Vermillion Lake hoping to connect to the Second and First. 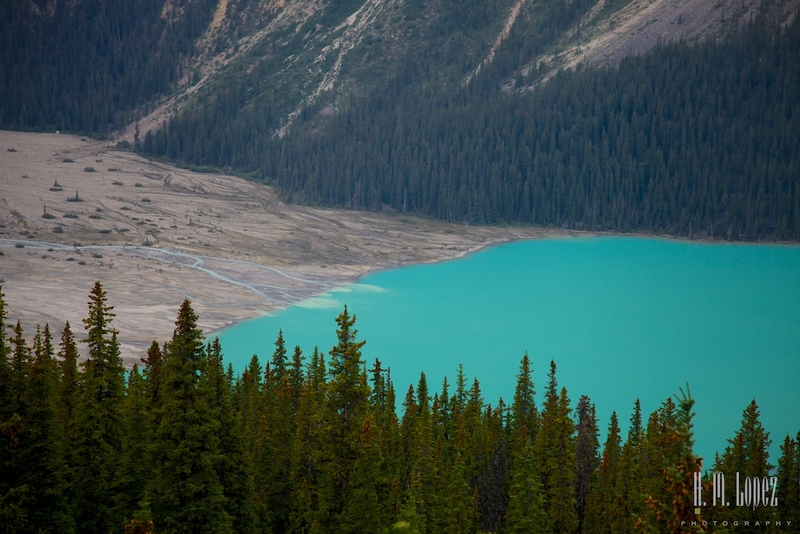 These lakes don’t have the brilliant blue color of other glacial lakes, but are so clear that at sunset they can turn various colors – frequently a shade of vermillion. 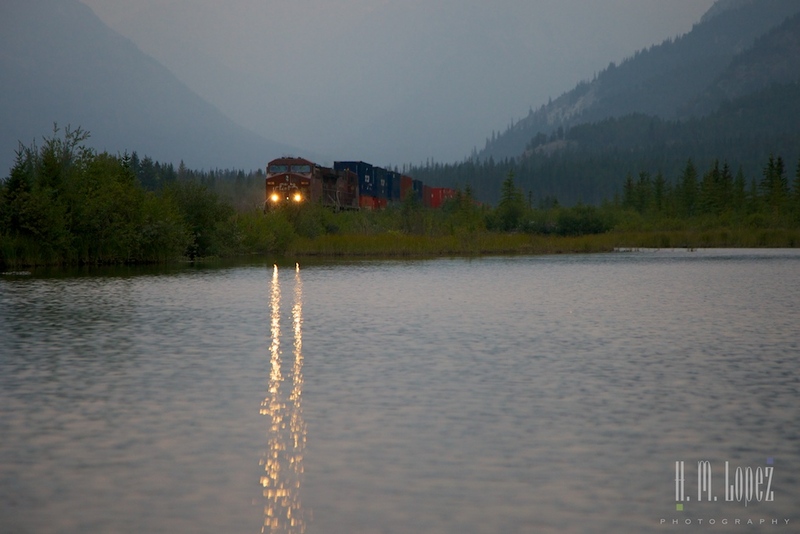 And, we had a first, kayaking right next to railroad tracks while a train went by – kind of freaky. Third Vermillion Lake didn’t have much birdlife so we tried to get over to Second Vermillion Lake. But the channel was way too narrow and shallow. 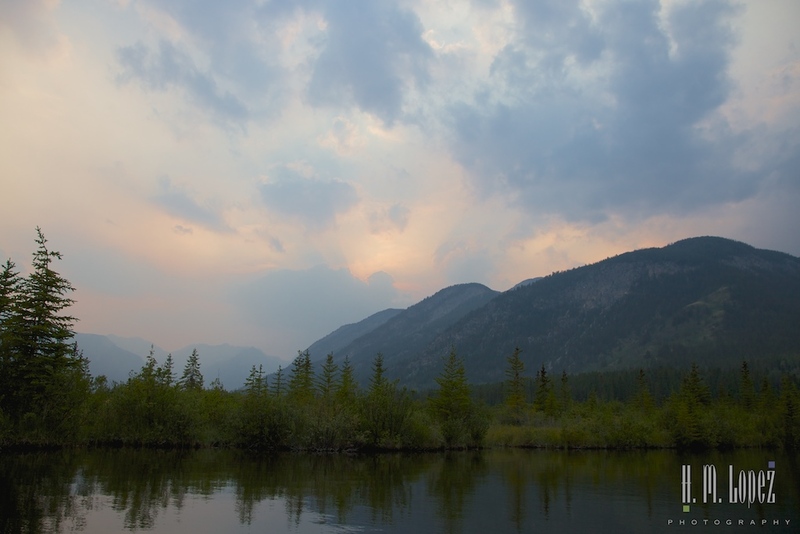 So we paddled around Third Vermillion Lake and enjoyed a subtle sunset all by ourselves at the lake. Beautiful. 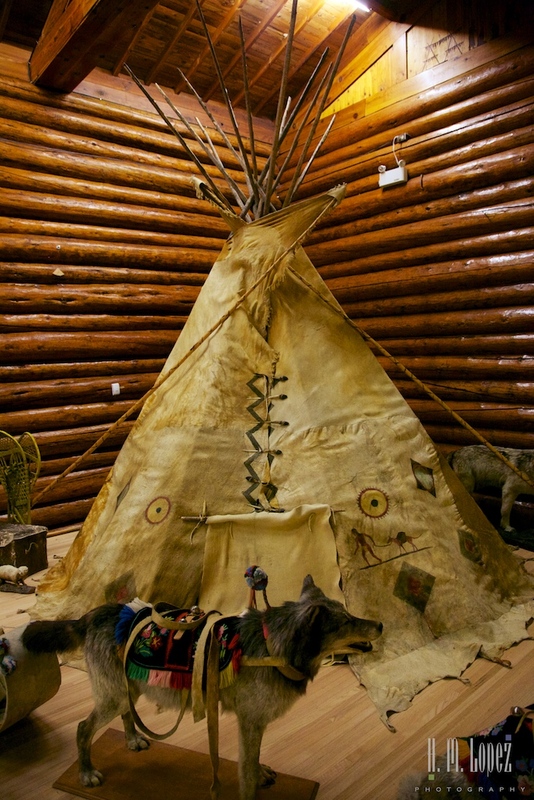 We really enjoy learning more about First Nations in Canada (Native Americans). 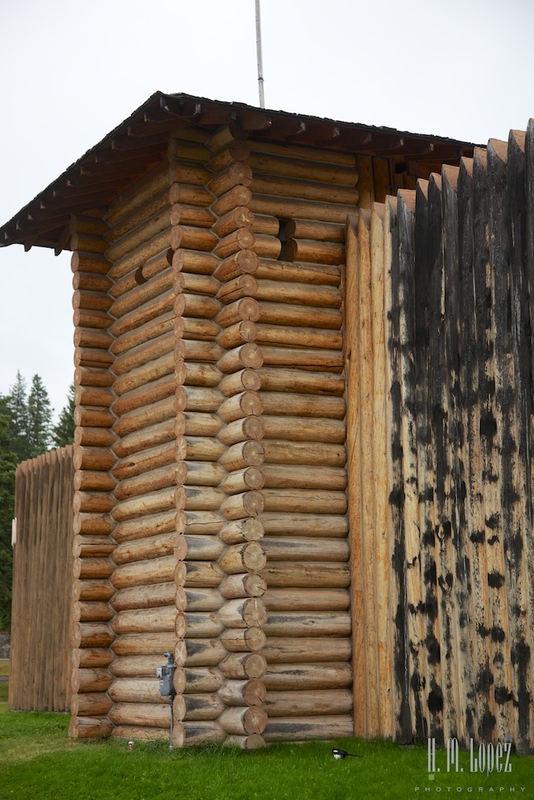 And we noticed the Buffalo Nations Museum in Banff because of its unique building: a log building built to resemble a frontier stockade. In a very pretty location by the Bow River. So we finally set aside some time to visit the museum. 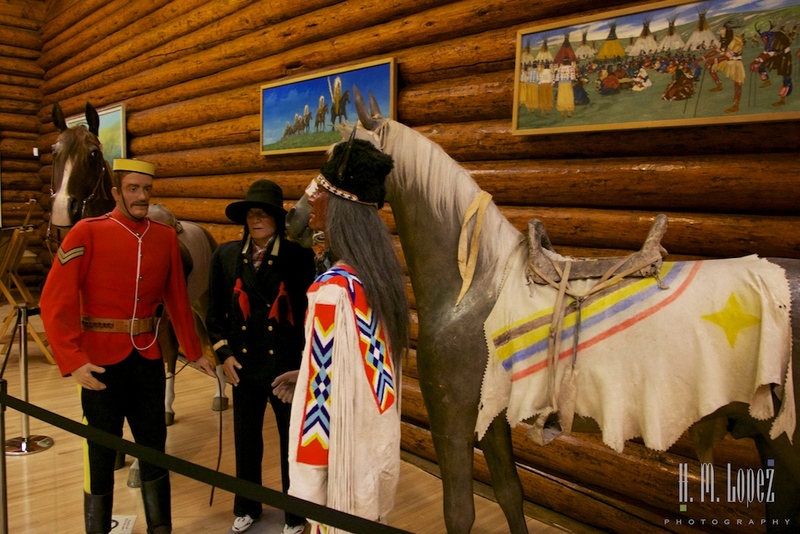 There are many artifacts including traditional regalia, quillwork, paintings, mounted animals, hunting tools, life-size scenes including humans, animals, ceremonies, tipis, and lots more. A very interesting museum. 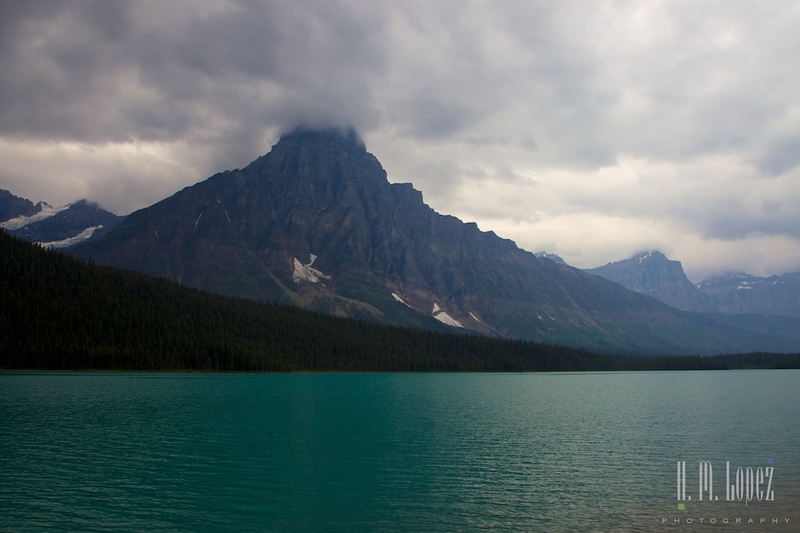 Much of the rest of our visit to Banff National Park was spent over by stunning Lake Louise. More on that in our next post. 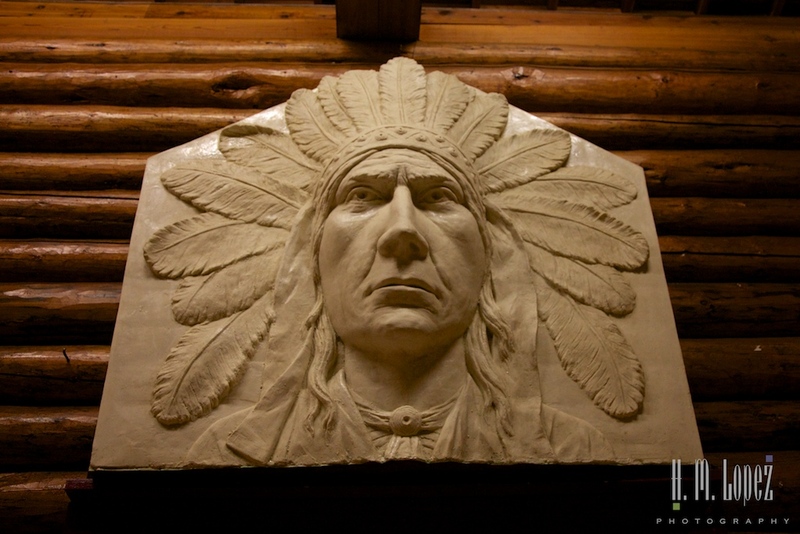 More great pics and documentation of your fabulous trip. I really love the description of the area and the lakes. The photography really shows the beauty of the area. I still love the waterfall shots best! Looks cold up there already. You folks ready to head south?? Thanks. The weather is just crazy, during our stay in Canada (July, August) temperatures ranged between high 40’s (mostly at night) to 90’s. Lots of weather in the 60’s which was not bad. Crazy. But just gorgeous. We’ll be ready to head south by October for sure. Will have a cold summer next year in Alaska, though. That’s so funny, Pam. 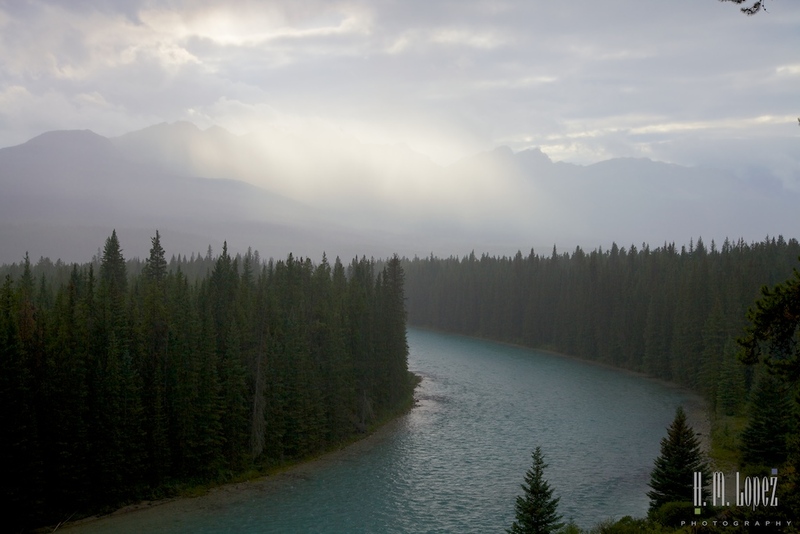 I think the whole area of Banff/Lake Louise is gorgeous no matter the weather. 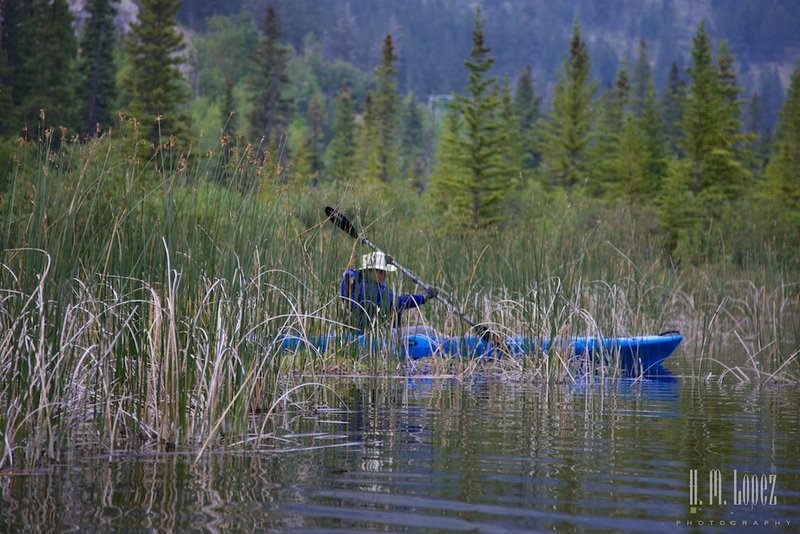 The Canadian rangers will chase people away if too many people gather to look at the wildlife (which they do). And there are the crazies who get way too close. 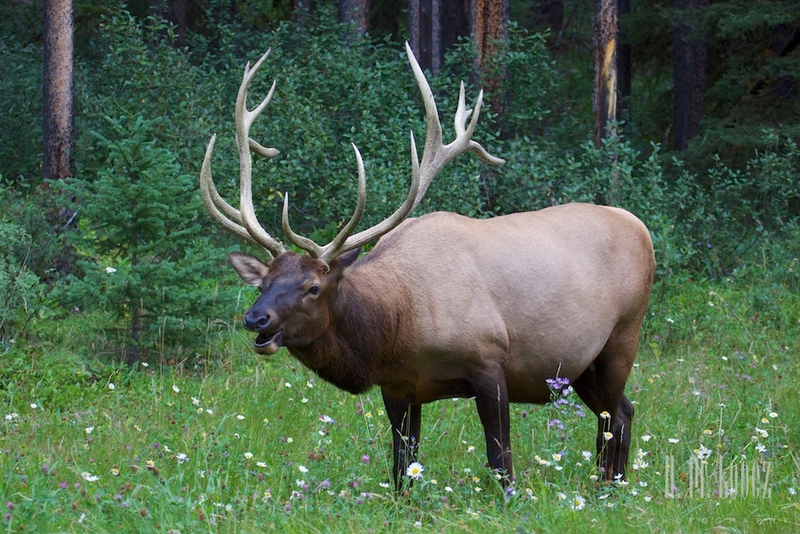 We saw two instances of people with little kids intentionally walking in front of a bull elk (!!!) for photos. Those guys seem pretty comfortable with humans but they are still wild animals. If you’re planning to go to Lake Louise, it’s even more crowded than Banff (hopefully less so by the time you get there). 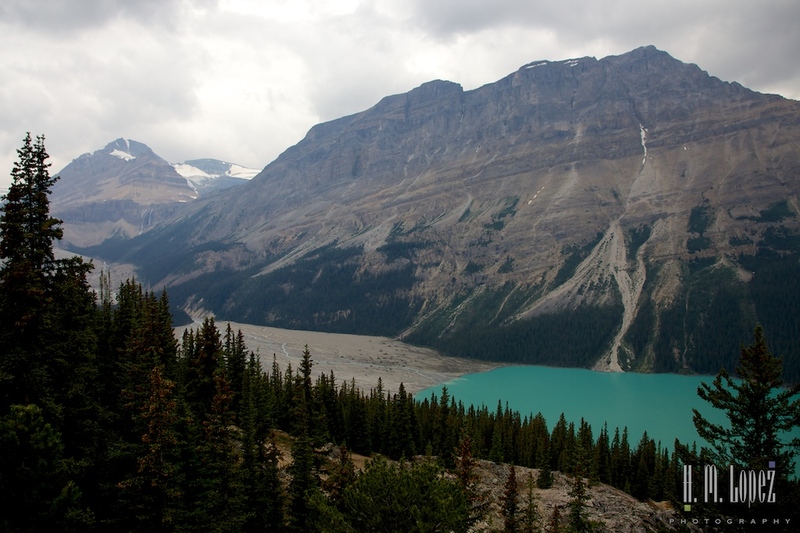 Anyway, you might consider staying in the Lake Louise area a few nights – it’s one hour from Banff, and being there will help you beat the crowds and save you two hours of driving – especially if you go more than once, which we did. 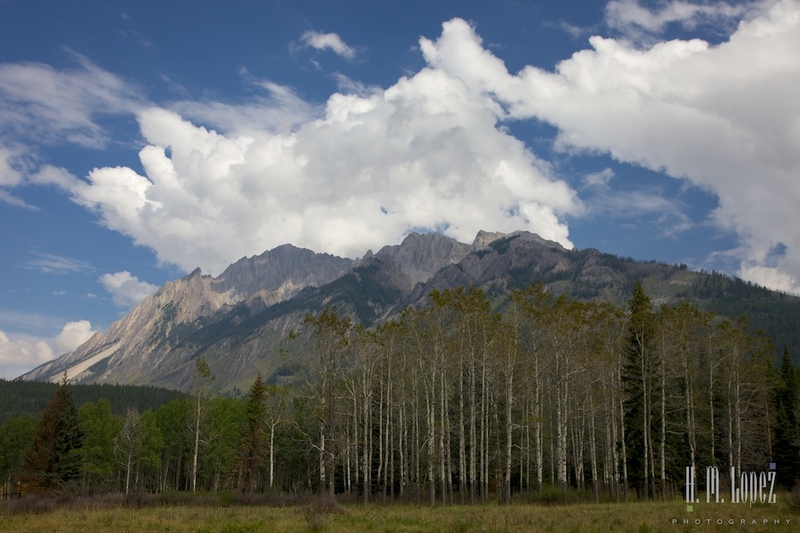 Although the Bow Valley Parkway is pretty cool and is where we saw the elk. 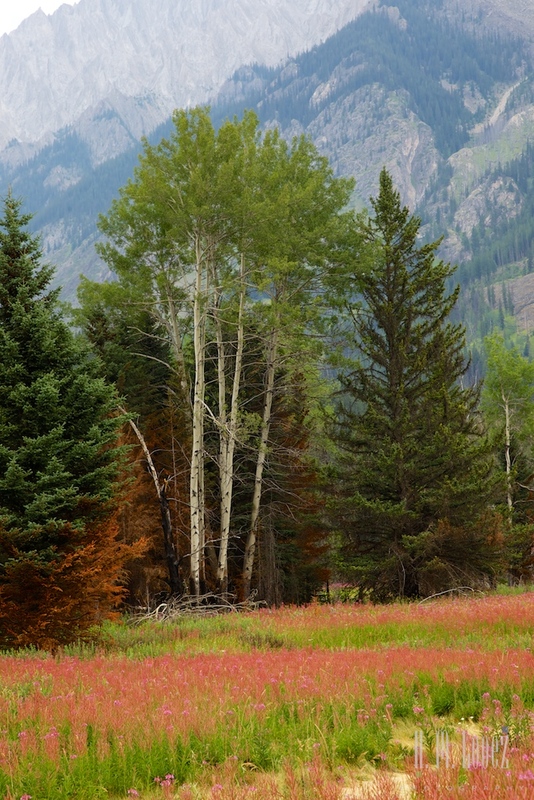 We’re staying in the west area of Glacier and wish we were in the East – oh, well, next time. Thanks, Brenda! It was tough to decide where to stay since we knew nothing about the area. 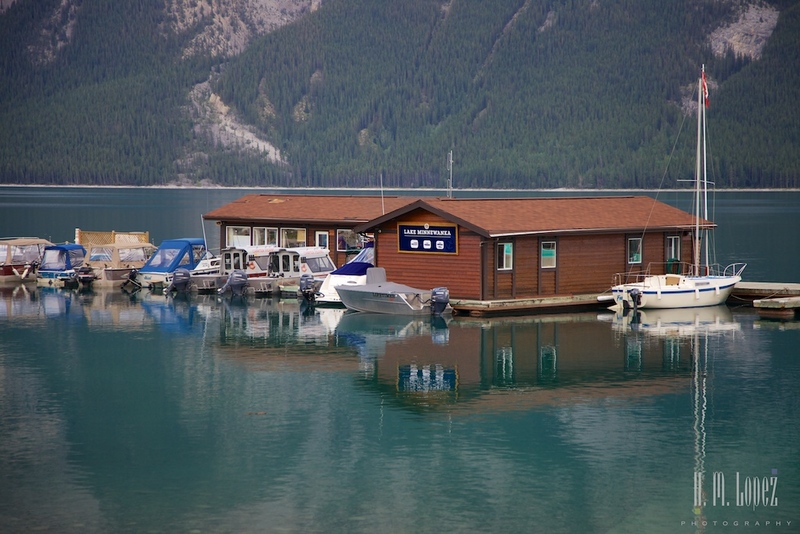 We went with reservations at both Jasper and Banff in their parks that have hook ups, especially electric. We may change a few things around once we get there and see what the weather is like. 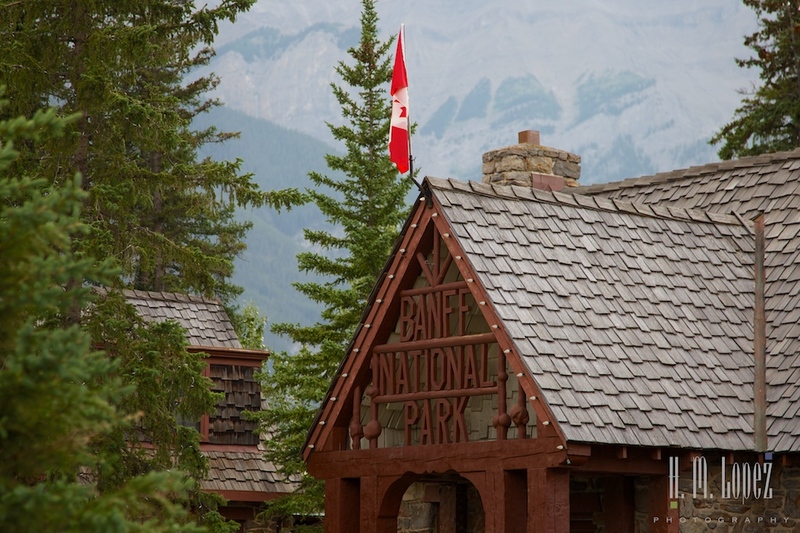 We don’t get ot Banff til Sept. 14th. So, hopefully, the crowds will be long gone. I understand. 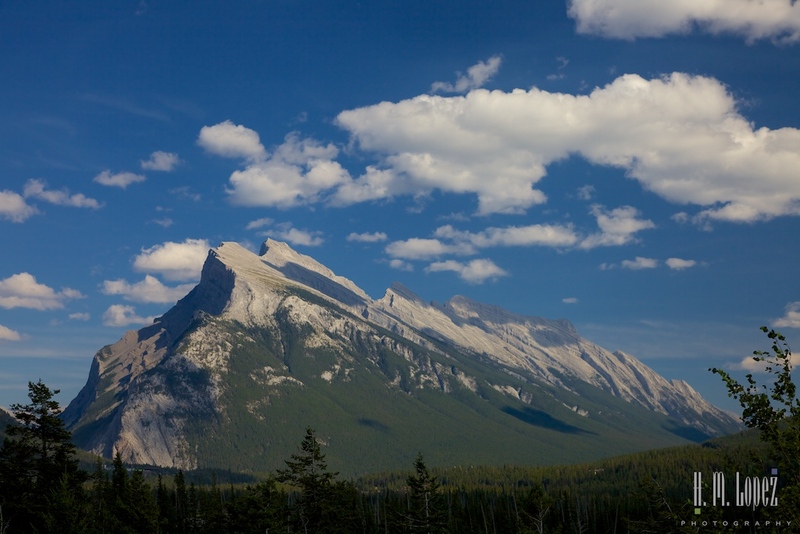 And now that you remind me of when you’ll be in Banff, I do think there will be no crowds. Should be great. Looks beautiful! Thanks for sharing. 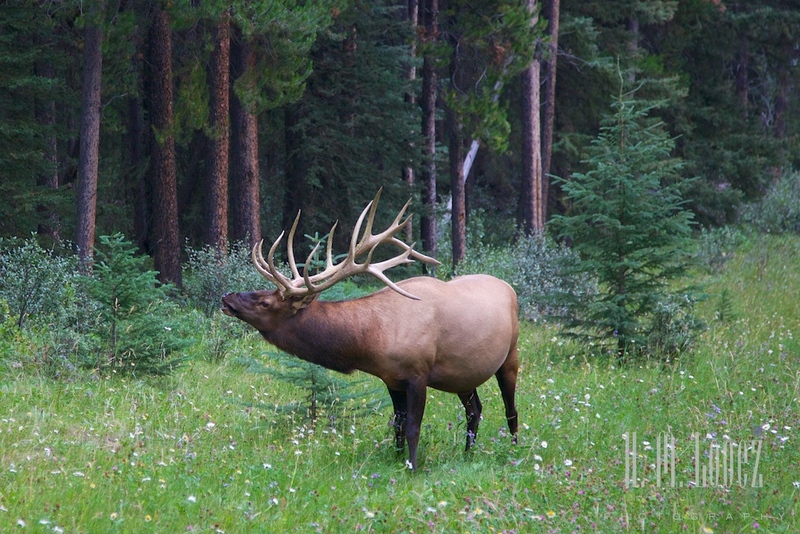 I loved your pics of the bull elk. He was amazing! Thank you. One of the things we enjoy the most is seeing the animals. Thanks, you won’t regret it if you do go there. I remembered those steep grades! Stunning stunning! Everywhere you look out there is just non stop of stunning scenery. Glad you are having a great time. Consider your drive there a sneak peak if AK is still in the plan someday. We didn’t really hike anything that steep, but little Angel is getting older. We definitely loved it. Next summer we are headed to Alaska, we changed from our original plan to go this summer because we didn’t want to rush through Canada. So next year we’ll stop at places that we didn’t get our fill of (almost everywhere, so we’ll have to choose). We’ll be planning our Alaska adventure this winter, so we might send you a question or two. You are so right about the beauty. 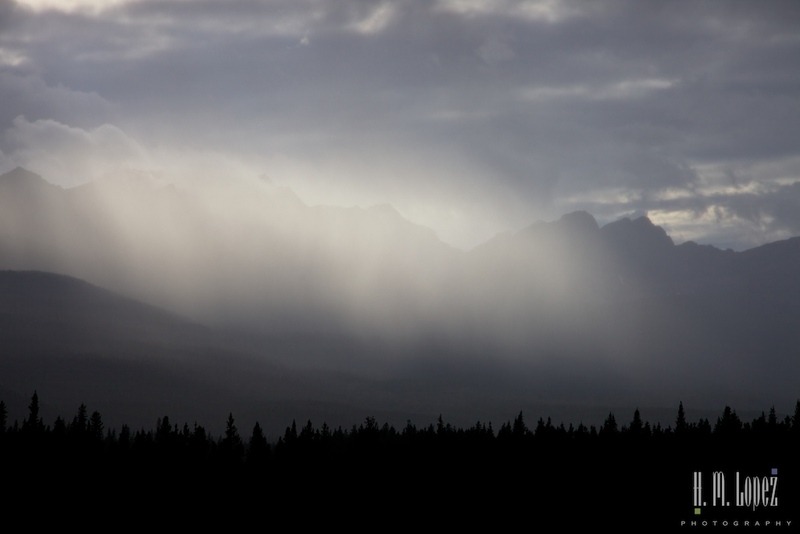 If you can, do allow more time, especially that with all of the weather changes in the mountains may force you to stay in some days. Just keep in mind that, except for the campgrounds, things are a bit on the expensive side. 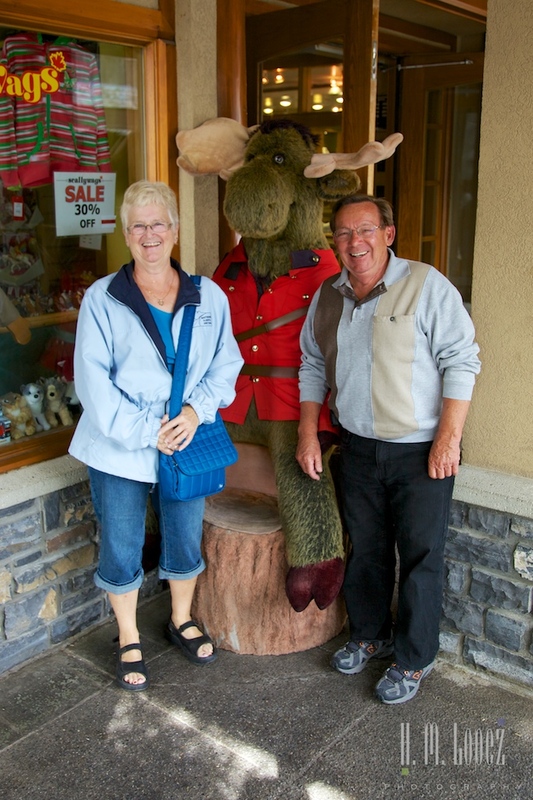 We’ll be going through Canada to Alaska next summer, so maybe we will meet somewhere. 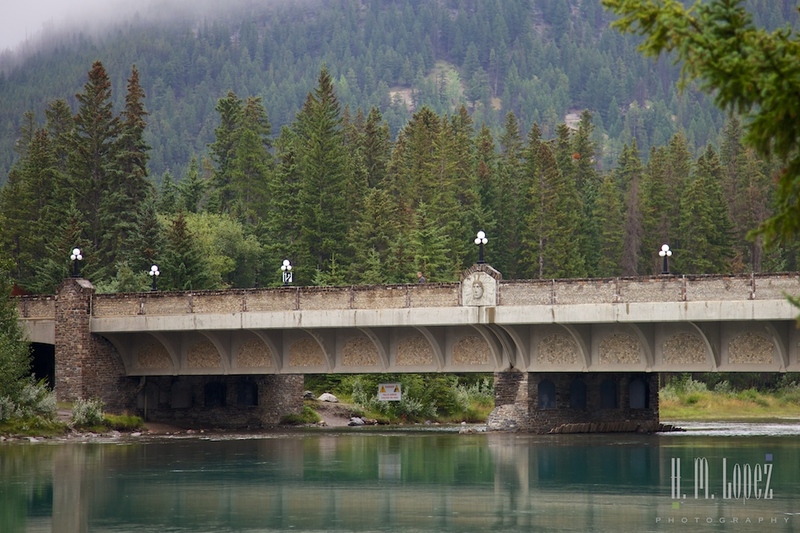 Banff, how gorgeous!!! I’ve always wanted to visit, but haven’t made it there yet. Someday!!! Loved the photos of you guys and Angel. You all look so happy and peaceful. The mountains and water look amazing!! 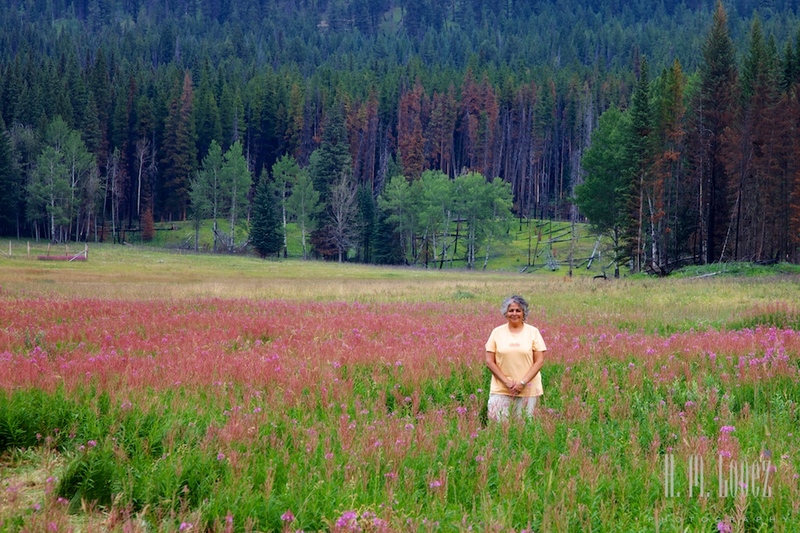 Especially loved the photo of Indian paintbrush, the state flower of Wyoming where I was born. Thanks as always so much for sharing your journey! Can’t wait to see you!!! 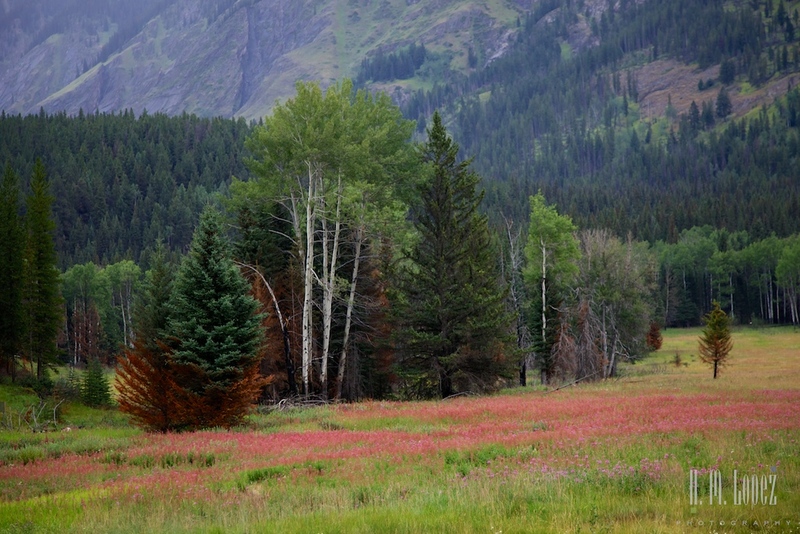 The Indian paintbrush is gorgeous, although there isn’t as much of it as some other wildflowers right now. Can’t wait to see you too. 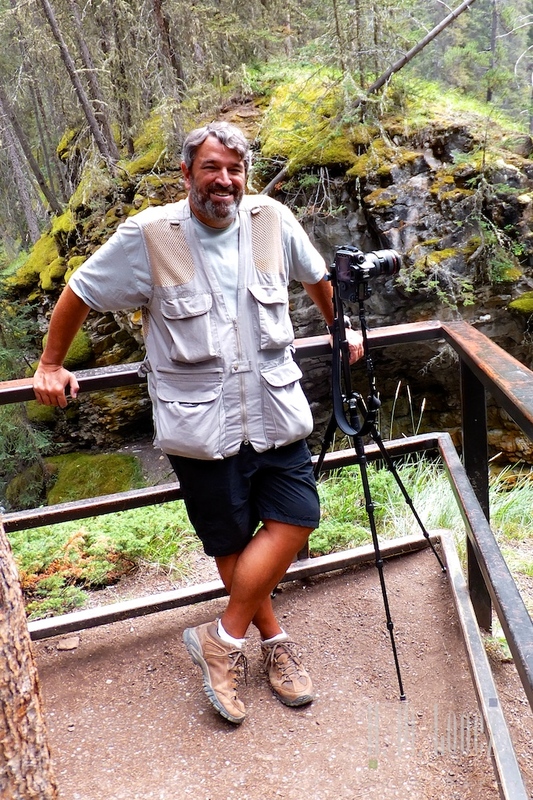 I’ve loved reading about your time in BC and ll the parks. 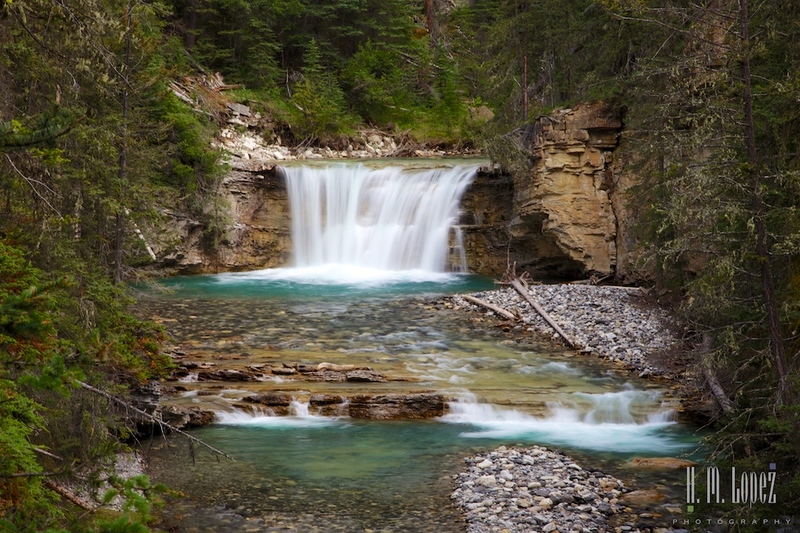 I recognize so many of the places in your pictures from our trips west 30 years ago – like Peyton Lake and Johnston Canyon. Wonderful! Oh, that’s wonderful that you’ve been to these places and are enjoying seeing them again. Happy to share.